December 18, 2017 - 12 Days of Holiday Specials -- Thank you for participating! March 15, 2017 - Patchwork Angels Quilt Shop will be closed Thursday, March 16, and Open Sew with Estie Mowry is rescheduled! March 14, 2017 - Patchwork Angels Quilt Shop will be closed Wednesday, March 15, and Quilting Basics Open Sew Class is cancelled! March 13, 2017 - Patchwork Angels Quilt Shop will be closed Tuesday, March 14, and Open Sew Classes are cancelled! February 13, 2017 - Patchwork Angels Quilt Shop is closed today and Monday Night Open Sew Class is cancelled! 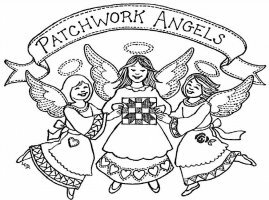 January 24, 2017 - Patchwork Angels Quilt Shop: Tuesday, January 24: Shop will open at Noon! January 24, 2017 - Patchwork Angels Quilt Shop: Tuesday, January 24: Shop closed until 2 pm! Check back at Noon for 2 pm decision! January 11, 2017 - Wednesday, January 12! We are open! January 3, 2017 - Happy 2017! December 26, 2016 - Holiday week! Salebration! Happy New Year! December 22, 2016 - Happy Holidays, Merry Christmas and a Happy New Year to all! December 21, 2016 - 12 Days of Christmas Specials - Thank you! December 3, 2016 - 12 Days of Christmas Specials - Are you Ready? December 2, 2016 - Free Motion Ruler Foot and Template Special available through Monday, December 5. January 22, 2016 - REMINDER: Saturday, January 23, 2016: Local Quilt Shop Day! December 1, 2015 - 12 Days of Christmas - Are you Ready?